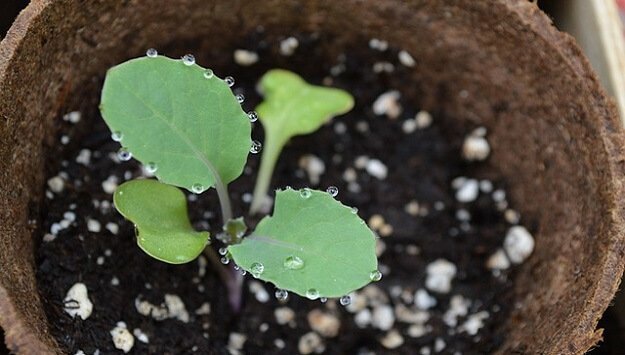 Sustainable gardening starts with the seed – it’s not just about watering efficiently or avoiding synthetic chemicals throughout the growing season (although those are important as well). Sustainable seed starting requires that you consider several different factors relating to sustainability – from the containers you start them in, to the planting medium. And of course, you will want to start off with high-quality seeds from a reputable provider. One alternative option is Coir—pronounced “kwaher”—the fiber from the coconut husks. It’s a renewable resource, drains well and requires less water than other potting soil materials… There several products on the market for the home gardener that use coir as the basis for their seed-starting mixes, or you can make your own. PittMoss, a product made from recycled paper, is another peat moss-free option… According to the company, their product allows for more air, more water, and more nutrients to be absorbed to your plants, encouraging higher yields and strong performance under stressful conditions. Once you have some healthy little seedlings, you may need to transfer them into a planter if it’s not time to plant them out in the garden just yet – or if you are growing in containers… One option is EcoForms: sustainably-produced planters made out of rice hulls and other grain byproducts and natural binders… They’ll last about five years outdoors and can then be composted.